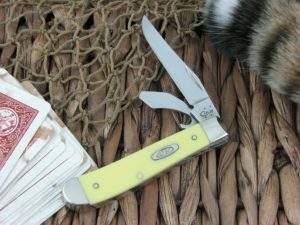 This is the Case Knives Barlow, has Yellow Synthetic handles and Brass liners. The blade steel is TruSharp and finish is Tumbled. *Our opinion: The pull is a 5. The Case effort on this run as compared to their entire catalog is 8. Action (walk) is 3 on a scale of 1-5, with 5 being gator snap. Spring Pressure is 2.9 lbs. Nice Barlow with wobble-free well-centered blades. Fit and finish, and blade pull and snap are also well done. Blade sharpness needed touched up a bit. 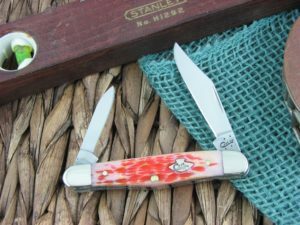 The 2-blade Barlow that I received is very nicely made, and substantial-feeling in the hand. Both blades are centered, and open with a nice snap to a tight, solid position with no play. 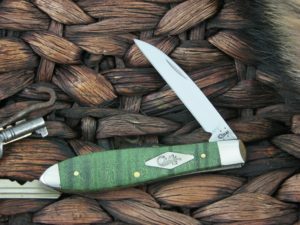 Fit and finish as well as walk & talk (smooth with good throw from half stop), are as good as I’ve gotten from more expensive knives. This Barlow closely matches a Case 62009 in dimensions that I have from the 1960’s. The bolster on the new one is a bit longer by maybe about 1/8″. The pen blade is also a bit longer, and a bit beefier than on my older knife…one of the things that go in the plus column for me. Went right into my pocket, and seems to like it there. 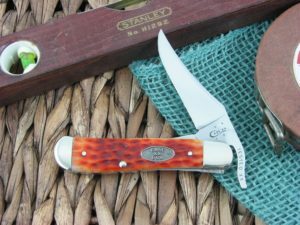 I believe this knife deserves the 5 stars I’ve given it. I’d probably try to give it six – if they’d have made it without the shield.